Manchester City boss Manuel Pellegrini says he has changed his character to make a success of management. 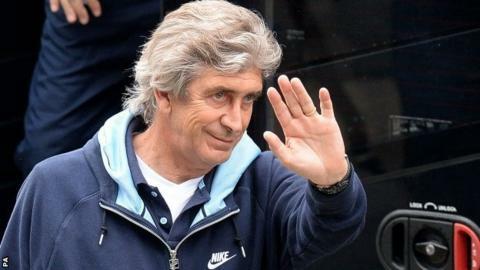 Pellegrini will lift the Premier League title in his first season in England if City beat West Ham on Sunday. He will do so by avoiding most of the controversies that were such a feature under predecessor Roberto Mancini. "As a player I was a different character to the one I am today. To prepare to be a manager you must change a lot of things," he said. During Mancini's time in charge, the Italian was involved in high-profile clashes with both Carlos Tevez and Mario Balotelli. Pellegrini, who began his managerial career in 1988 in his native Chile, added: "You have to understand you are not a player and have another attitude with the players." With a two-point advantage over Liverpool and a much superior goal difference, Pellegrini's men realistically need just a draw to win their second title in three years. The potential for a nervy finish does still exist, but any jitters are not being portrayed by City's unflappable manager. Asked if he suffers from nerves, the former Malaga coach, 60, said: "I know how to control (them) - it is different. "After so many years, it is very important to control your emotions because when you have to take decisions under emotion normally you do it the wrong way."